QuickSpin are a Swedish gambling software developer who focus on creating video slot machines. Their games are stocked by a number of big name online casinos and their portfolio of titles is growing at a rapid pace. This page will get you up to speed with the slots games which they produce and the payout percentages they offer so you can easily find the best and worst QuickSpin return to player percentages. At time of writing, in 2018, QuickSpin have a portfolio composed of just over 40 separate video slots titles, with 31 of those games being available for mobile play as well as on desktop. That number is set to rise rapidly, however, as QuickSpin have a stated aim of releasing 12 new slot games each and every year. An aim they intend to achieve by always having six slot prototypes on the go and 30 different concepts being worked on at all times. ‘passion for slots shines through in their unique craftsmanship’. Hallmarks of that craftsmanship are developed characters and worlds, enhanced gameplay and an added depth of atmosphere. As QuickSpin develop and launch more slots, too, they often take the opportunity to introduce features which then recur in future games. The firm’s most recently released slot, Joker Strike, is a prime example in that it is the first title to include a so-called ‘Hi Roller Mode’. That is a new QuickSpin feature which according to the company, ensures that ‘the bigger bet you place, the bigger the prizes that are up for grabs’. QuickSpin’s portfolio of video slots, alongside their other software solutions, have garnered the company a far greater reputation than their physical size and have also seen them collect some notable accolades. Those include prestigious EGR Awards in the Social Gaming Supplier (2014), Mobile Gaming Software (2014) and RNG Casino Software (2015) categories. The highest paying game Quickspin make, in terms of return to player percentage, is Joker Strike at 98.11%, on the other side of the coin the worst paying is Spinions at 96.04% – the overall range being 96.04-98.11%. Like most manufacturers at the top end you’re getting a pretty decent deal, playing a slot with low house edge, however move down through their titles and things don’t quite look so good. The average RTP% of Quickspin slots is 96.62% which when compared with the payouts on other slots is actually pretty damn favourable. Bottom line here is that Quickspin are, on average, making games with higher payout percentages but to really get a great deal you need to be playing the titles at the top of their range (which is the case with pretty much all developers). Knowledge is power where payouts are concerned. QuickSpin is a Swedish game studio, which develops innovative video slots for both real money online gambling and the free to play social gaming market. At time of writing, the company has approximately 60 employees, primarily spread between their headquarters in Stockholm, Sweden and their registered office in Malta. ‘to cause a market-changing shift in quality and innovation by creating the kind of slots that we as players would love to play’. The idea that those working for QuickSpin are also slots players is clearly important to the company, and their company motto of ‘we love slots’ is a prime example of that. According to QuickSpin, it is that focus on player experience which shines through in the slots which the company produces, with all of those games demonstrating added gameplay depth and an engaging atmosphere. QuickSpin have managed to position themselves as a leading producer of those innovative and popular slots in spite of having only been in business for a little over seven years. The company was originally founded in Stockholm, Sweden in 2011 and quickly started to develop an impressive portfolio of not only video slots titles, but also related software platforms and solutions. That diverse portfolio of offerings helped QuickSpin to develop relationships with leading online gambling providers around the world, and in 2016 led to the company being acquired by online gambling goliaths Playtech. The value of that acquisition was not made public and QuickSpin have continued to operate as a largely autonomous company under the general Playtech umbrella. With the help of their parent company, QuickSpin have managed to provide some of the world’s leading online casinos, such as Casumo, Unibet, BetVictor and 188Bet. What they provide those leading brands with, too, is far more than just video slot games. They also develop and supply a cutting-edge software platform and a range of innovative and ground breaking promotional tools. The QuickSpin software platform fully integrates within an online casino and gives the casino operator a complete casino management system. That includes access to a comprehensive Back Office, which gives casinos the ability to monitor statistics, manage promotions and complete any number of other crucial activities. QuickSpin’s promotional tools, meanwhile, are grouped together as a suite known as QuickSpin Promote. 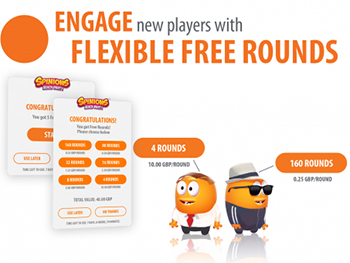 The most notable and innovative of those tools are the company’s Flexible Free Rounds feature, Achievements Module and Game Events. The so-called Flexible Free Rounds feature lets online casinos allow their players to experience any QuickSpin slot game for free with whichever stakes they prefer. The Achievements Module, meanwhile, add an extra game play layer to every slot by allowing players to progress through four levels of achievement, monitoring their progress, claiming and using related rewards as they do so. Game Events, finally, are specific occurrences during QuickSpin slot gameplay which casinos can monitor and use to run promotions or trigger player rewards. As useful as those tools are to online casinos, and the fact that QuickSpin slots are prominently positioned on the world’s most successful online casinos suggests that they really are, it is QuickSpin’s portfolio of video slot games for which the company is most famous.